ECS one of the most experienced companies in computer motherboard building revealed today an all new AMD FM2 chipset based motherboard with a Golden Limited Edition features, the ECS A85F2-A GOLDEN, with an exclusive gold plating technology for the strictest quality and a higher outstanding performance supporting the AMD's Trinity technology platform. 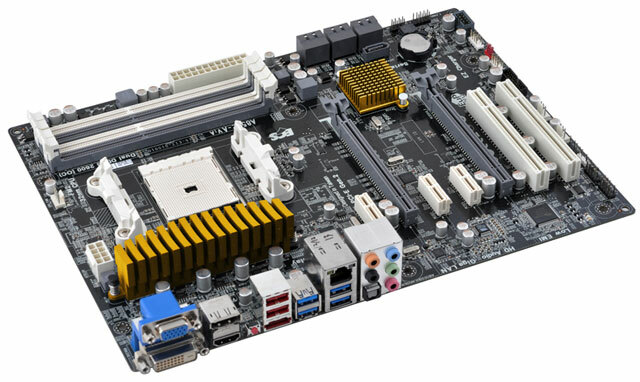 Bellow more features and specifications on an ECS press release about the A85F2-A GOLDEN motherboard. Key features include: World 1st AMP Technology support to take the full advantage of their unique operating design, newest graphical uEFI BIOS: EZ BIOS, with stunning user-friendly interface and easy-to-use function radically takes full advantage of the performance, high-end gaming, multi-tasking and Windows 8 support, ATI CrossFireX graphics support with next generation PCI Express 2.0 to achieve the ultimate in 3D gaming performance, separate 4 display output design allowing users to fully satisfy their visual quality and growing demand. ECS A85F2-A GOLDEN is one of the most powerful and reliable motherboards for gaming solution. 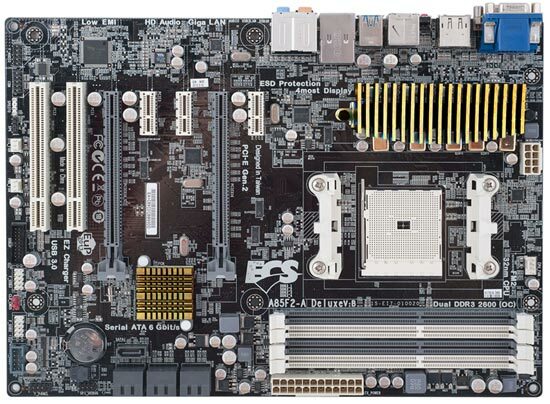 In the ATX format, this ECS motherboard features 2 PCIe x16 slots for graphics card upgrades and CrossFireX support, as well as 3 PCIe x1 and 2 PCI slots for different demands. Up to 64 GB of dual channel DDR3 memory can be installed in 4 DIMMs, with full maximum speed from 1866 to 2133, or up to 2600 for high-end overclocking. Expansion and connectivity options in the A85F2-A GOLDEN include 7 SATA 6 Gb/s connectors, 6 USB 3.0 ports, 8 USB 2.0 ports, Gigabit LAN, and a eSATA 6Gb/s connectors for fast external storage. Separate HDMI, DVI, D-Sub and Display Port provide graphics output, and 8-Ch HD Audio support. ECS A85F2-A GOLDEN is certified by ECS Nonstop Technology for the ultimate stability and reliability. ECS Nonstop Technology deliver a hassle-free computing experience by solving common PC hardware problems before they can even occur. Hardware enhancements and a strict series of specially-designed tests combine together to protect PCs and ensure that all ECS Nonstop Certified motherboards can be relied on for stability and reliability far into the future, long after competing products have failed. Nonstop features include enhanced gold plating on critical contacts, and all solid capacitors and Electrostatic Discharge (ESD) protection for VGA, USB, LAN and HDMI ports. iPhone 5 Vs iphone 4S what's new ?